Jack Hume came back from four down at the turn to win a crucial singles point on the 18th at Ganton. 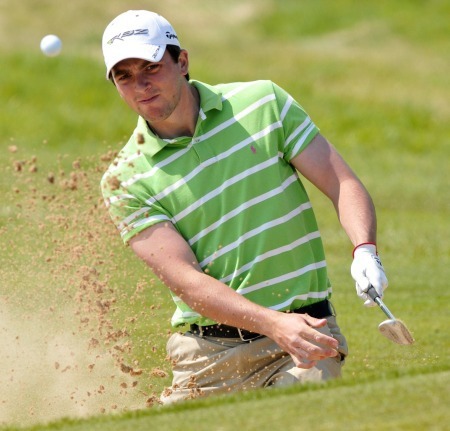 Archive picture by Pat CashmanCaptain Pádraig Hogan admits that Ireland are struggling to find a winning foursomes formula but a 6½- 8½ win over reigning champions Scotland gives them outside chance of winning the Home Internationals at Ganton on Friday. The boys in green lost the foursomes session for the second day running, going down 3-2. But six wins and a half from the 10 singles - with an epic performance from Jack Hume - saw Hogan’s squad clinch a crucial, two-point victory. Ireland must now rack up a big win over Wales on the final day and hope that Scotland beat England, who were comprehensive 11-4 winners over the Welsh on Thursday. However, they will do so with a drastically changed foursomes line up and no Chris Selfridge - out with a neck injury. Hogan was true to his word about the foursomes and made wholesale changes (admitttidely forced in part by Selfridge’s absence), leaving just one of today’s pairings unchanged for the final day - unbeaten opening pair Dermot McElroy and Kevin Phelan. As for today’s win over Scotland, McElroy and Phelan beat Graeme Robertson and Jack McDonald 2 and 1 while Gavin Moynihan and Selfridge defeated James Ross and Ewan Scott on the 18th to give Ireland a 2-0 lead. However, defeats in the other three foursomes left Hogan’s men in arrears and it took an impressive singles performance to keep Ireland’s hopes of winning the Raymond Trophy alive. Brian Casey led the way with a 4 and 3 win over James Ross then Gavin Moynihan took the top game 2 and 1 against Graeme Robertson. Moynihan was 3-up after going out in two-under-par 34 and although Robertson pegged it back, the end came at the 17th. Dermot McElroy found himself two behind early on to Jack McDonald, who was also out in 34, thanks to an eagle at the ninth and 1-up. McElroy levelled with a birdie-two on the tenth, went ahead with another on 12 and they swapped further birdies until a par on the last saw an impressive McElroy take the point by 1 hole to maintain his 100 pecent record. Grant Forrest edged past Phelan 2 and 1 and Alex Culverwell secured their biggest winning margin, 4 and 3 over Cormac Sharvin before a half by Reeve Whitson against Scott Barrowman. Paul Dunne, Jack Hume and Rory McNamara got Ireland over the line with Hume the man to secure the crucial point. Four down to Scott Crichton at the turn, Hume made two birdies and won four holes-in-a-row from the tenth to get back level. Although Crichton led again with a birdie at the 14th, Hume covered the last three holes in par to win by one hole. England are favourites to regain the title after demolishing Wales 11-4 and need only a draw with Scotland, who need to win. Ireland must rack up a big win over Wales and hope that Scotland beat England. “Now, it’s in our own hands,” said England captain Terry Casey. “We know it won’t be easy. It never is against the Scots. • Should there still be a tie on the number of points the higher placed team in the previous year’s meeting shall have preference. Ireland claimed the Men's Home Internationals for the first time since 2008 when they beat England 9.5-5.5 to claim the Raymond Trophy and the coveted Triple Crown at Southerndown in Wales. 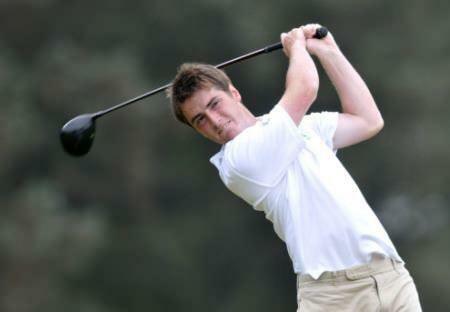 Mourne’s Reeve Whitson won both his matches against Scotland. Picture by Pat CasmanIreland completed a spirited singles fightback to beat Scotland 8-7 in the Home Internationals when the weather delayed opening match was completed at Glasgow Gailes this morning. 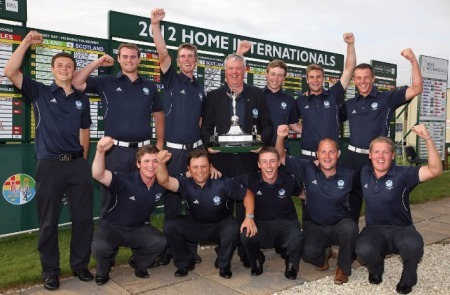 The victorious Scotland squad celebrates with the Raymond Trophy. Picture via ScottishGolf.orgIreland had to settle for second place after defeat to England and a big final day win for Scotland over Wales gave the hosts the Home Internationals on a countback at Glasgow Gailes.